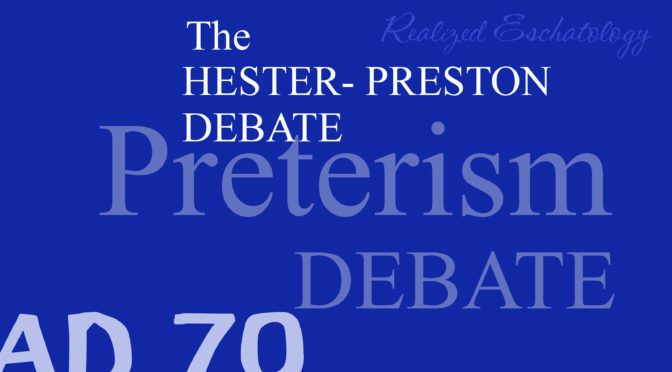 Yesterday, we gave a very brief review of our impressions from the first night of the Hester-Preston debate, when Don Preston affirmed that the final coming of Christ and the resurrection of the just and the unjust took place in AD 70. Today, we will review the second night, when the roles were reversed. (note: as stated yesterday, a much fuller review, complete with quotations and specific arguments will appear in the first issue of the Quarterly). Proposition 2: The Bible teaches that the Second (final) coming of Christ and the attendant resurrection of the just and the unjust, is yet future, and will occur at the end of time. David Hester opened the evening’s discussion by clearly defining his proposition and then giving 23 numbered arguments for why the resurrection could not have taken place in AD 70. I thought some of them were powerful and worth consideration, and a couple of them I would have suggested he leave out. He spent a decent amount of time speaking about the Lord’s Supper, which was to show the death of Christ “until He comes,” pointing out that if Jesus came in AD 70, then the Lord’s Supper really doesn’t show anything at all anymore. Preston’s response focused mainly on reiterating his arguments from the night before, and he only specifically mentioned four of David’s twenty-three arguments. He pointed out that David didn’t answer all of his arguments from the night before, restating several of them. He also brought up a couple arguments against David’s proposition by appealing to specific Greek constructions in certain passages. In his second speech, Hester requested that Preston answer the arguments given instead of “rehashing” things from the night before, since this was a new proposition. He also showed some examples from the Bible that disproved one of the Greek arguments that was made, while also spending much time affirming that while the time of the destruction of Jerusalem was known by Jesus and the apostles, the time of the final judgment and resurrection was not. Preston, in reply, argued his points again (except for that Greek argument), emphasizing that his arguments from the night before, while not specifically answering each detail of Hester’s 23 arguments, were sufficient to disprove them. He also spent a good deal of time giving arguments against the idea that the apostles didn’t know when the second coming of Jesus would be (specifically John 16, “He will guide you into all truth). David Hester spent around half of his final speech quoting translations and recognized Greek scholars in regards to the Greek word “mello,” which Preston says means “about to” and stresses imminence. He also reiterated some of his previous arguments and gave Acts 1:7 as proof that the apostles weren’t privy to the time of the final coming of Christ. Because of Hester’s understandable, structured presentation of the material, and Preston’s lack of specific answers to 80% of the arguments put forth, our impression is that the proposition affirmed by David Hester was successfully defended. Again, as we said before, there wasn’t time to sufficiently cover each argument, but there was opportunity to deal with more than four of them, which we believe would have been a better use of Preston’s speeches. Having said that, Preston did offer some evidence in his rebuttal speeches that deserves further study. But these were not sufficient in and of themselves to successfully negate the proposition being argued. Both men were very passionate about their position, and would occasionally get loud and point fingers. But it was conducted in a very dignified manner, and both men were engaged in a friendly conversation afterwards. The two men are considering debating again in Alabama at some point in the future, if proper arrangements can be worked out. If you hadn’t heard, there was a debate this past Thursday and Friday in Ardmore, OK. The Cobb Six made the two-hour trip to be in attendance, so what you’re about to read is a review from an eyewitness. We had some other friends who made the trip (and came from a lot further than we did), and after talking with them, our impressions were, for the most part, the same as theirs. As is normally the case after a debate, both sides are claiming victory, saying that the other side couldn’t handle their arguments. Note: this is a brief review. A much fuller, detailed treatment of the topic (with specific arguments and quotations) will be appearing in the first issue of the Quarterly. This topic was supposed to be the subject of debate the first evening. Don Preston opened the debate with a 30-minute talk that covered a LOT of ground (he spoke faster than most anyone I’ve heard during his first speech). He made several points that I thought were interesting and worthy of further study, but unfortunately, there was no real structure, and he neglected to define his proposition, which made his opening argument confusing. He also made several connections between passages, but didn’t stop to show us why they should be connected–and at the speed he was talking, it was impossible to write all the passages down. I spoke with a friend of mine who agrees with much of what Don teaches (having watched and listened to many of Don’s lessons), and he said that he gave it a 7 out of 10. But then he said, “unfortunately” it was “probably a 2 out of 10 for someone who never heard [of] Realized Eschatology before.” (note: Realized Eschatology is another name for preterism). In short, it was as though Don was talking only to those who already agreed with him, and not to try to show others why preterism should be preferred. David Hester had a difficult time following Don’s first speech, because without Don defining the proposition, there was no real basis to start from. So, David spent most of his time showing that the Law of Moses ceased being valid when the kingdom came into existence at Pentecost (Don takes the position, if I understand correctly, that the Law of Moses was still valid and in force until Jerusalem was destroyed). While he made some excellent points that deserve consideration, this issue isn’t directly connected to the proposition. The second set of speeches by both men followed pretty much the same pattern, except that Don slowed down tremendously in his speaking. Each side said that the other was avoiding or misrepresenting their arguments. Prior to the debate, Don had sent David several questions, and then used David’s answers as part of his speech, with a “David vs. Paul” theme. While this was interesting (and David did some clarifying of his answers in his response), Don was trying to “negate” what David had answered instead of “affirming” the proposition at hand. The final speeches of the night were very similar to the second ones in their emphasis. All in all, we were disappointed with both sides of the debate the first night. Don never defined his proposition (he would say the next evening that it was a waste of time to define it), and didn’t really deal much with the “resurrection of the just and the unjust”; and David’s responses also didn’t really touch the proposition either, and instead of answering many of the arguments Don put forth on various passages, David spent his time in a thorough attack on just a couple. Neither side could claim a definitive victory, because the specific proposition itself wasn’t the focus of either side’s speeches. (note: Many of Don’s arguments might have been supplementary to his position, but it was never brought together to show “this is how it all fits together to prove my proposition”). The debate itself can be viewed online here. Tomorrow we will give a brief review of the second night of the debate. This debate was proofed and formatted by one of our volunteers, and it doesn’t look too shabby. And to top it all off, it’s free! To read online or to download it, just click the link below! There exists within the churches of Christ some who believe that alcoholic wine is permissible to use during the Lord’s Supper. But beyond that, there are those who teach that to use anything other than alcoholic wine in the Lord’s Supper is sinful! Most of the ones who hold that position are among our brethren who use a single drinking vessel (i.e., one cup). Obviously, just because some among them hold that view does not mean that all–or even most–of them do. Recently, I came across two debates which dealt with this subject, and they are today’s additions to the Jimmie Beller Memorial eLibrary! 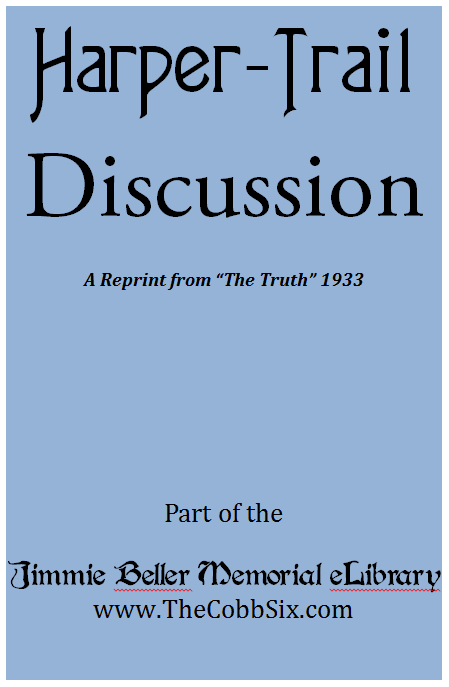 This written debate took place in 1933 and was published in H.C. Harper’s paper, The Truth (Later known as Old Paths Advocate). Brother A.J. Trail takes the position that only alcoholic wine can be used in the Lord’s Supper, while brother Harper argues that only non-alcoholic grape juice is permitted. It is Scriptural to use grape juice as the drink element in the communion. It is Scriptural to use fermented grape wine as the drink element in the communion. We have corrected several spelling and typographical mistakes (and a couple mistaken Scripture references) in preparing this debate for you. We hope you will find it to be interesting! Scroll down for the download link! 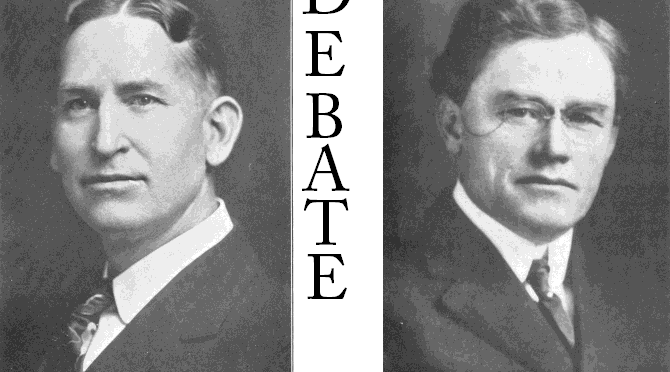 The Smith-Bledsoe debate is interesting in that it is only half of what it was meant to be. 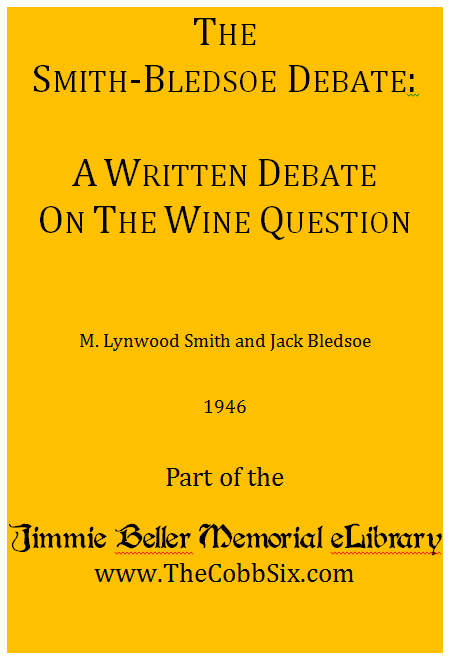 M. Lynwood Smith affirmed that grape juice was the only thing allowed under the phrase “the fruit of the vine,” while Jack Bledsoe argued that both alcoholic and non-alcoholic grape juice (or wine) were equally acceptable–though he puts forth the idea that alcoholic would be more in keeping with the Bible. For some reason, the second part of the debate, with Bledsoe in the affirmative, never took place. One man claimed that Bledsoe quit because he couldn’t answer the arguments, but one look at his final rebuttal in this work shows that certainly wasn’t Bledoe’s belief or attitude. We have corrected several typographical errors, spelling problems, and some Scripture references in preparing this work for you. We hope that you will find these two short debates to be interesting and will help you to better understand the actions of our Lord in taking “the fruit of the vine” which He said was His blood. As a bonus for you, our readers, we are presenting to you another FREE book, being added to the Jimmie Beller Memorial eLibrary. As you probably already know, we post new books to the library each Tuesday, but this week, we’re doubling down and giving you a new book today as well! 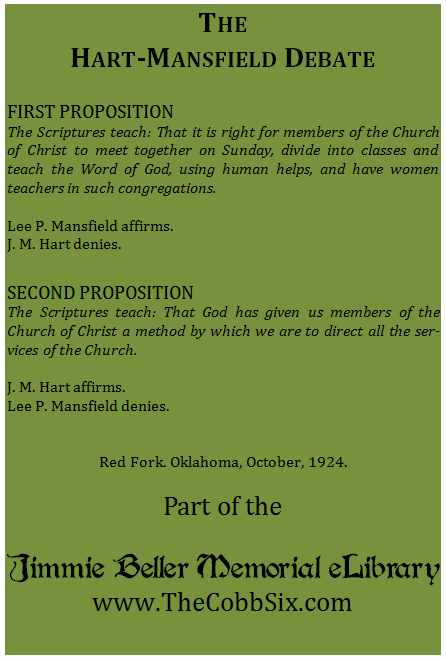 Lee P. Mansfield affirmed that (1) having separate Bible classes for different age groups, (2) using material prepared by others, and (3) having women teachers in the classes composed of children were all Scripturally authorized. J.M. Hunt, on the other hand, affirmed that God provided every acceptable method of teaching in the Scriptures, and therefore (1) separate classes, (2) material provided by uninspired men, and (3) using women to teach any class were all sinful. As with almost every debate, there are parts that could have been done better (and this is true on both sides of the debate), as well as some issues/arguments which weren’t addressed. But this book provides some insight on some of the arguments used by some of those on each side of the disagreement. 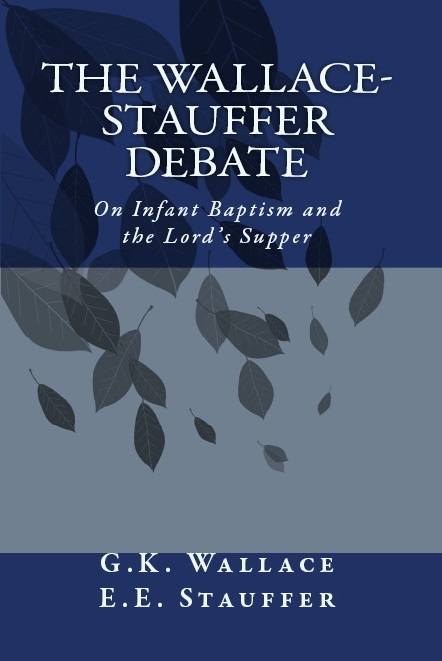 We have made an enormous amount of corrections to this debate, including fixing spelling errors, typographical errors, incorrect Scripture references, some grammar, and some incorrect names (one of the writers appealed to what “Paul” said at Pentecost, and we’ve corrected that to “Peter,” so that the writer’s mistake doesn’t take away from the point he was trying to make). We hope that you will find this debate to be interesting and will help you if you ever happen to find yourself in a discussion of one of these three topics. Sometimes when you read a debate, your eyes are opened. Oftentimes we assume that we understand where the other side is coming from, when in actuality, it’s different than we thought–and that’s important for us to realize, because sometimes we can spend all our time arguing against something they don’t really believe in the first place. In June, 1984, Mr. John R. Iler, Jr. wrote me after reading my debate with James Crackin, an atheist, as that debate was featured in an issue of THRUST magazine. A friend of Mr. Iler’s, in Kentucky, had obtained a copy of THRUST and had forwarded it on to him. Mr. Iler stated that he was involved in a missionary endeavor of the Latter-Day Saints, and was one of the “Seventy in the Church.” He stated that he was currently working on a manuscript in defense of the Book of Mormon and the Church of Jesus Christ of Latter-Day Saints, and asked if I would be interested in debating “Mormonism.” I then accepted, and in our correspondence plans were made to have the debate printed in this present form. We trust that all who read this will gain benefit, and we express our thanks to Mr. Iler for his willingness to defend those things he believes. Not being thoroughly studied-up on Mormonism, there were some arguments put forth that I hadn’t heard before, and some valid criticisms leveled on each side. I wish this debate could have been longer and certain issues addressed (there were arguments completely ignored by both sides, unfortunately), but it is a good overall treatment of the topics. As always, we’ve taken this book and completely reformatted it, correcting any typos that appeared in the original and giving it a fresher look. To read online, or to download to your computer/tablet/phone/etc… just click the link below! The topic is one that I’ve written on before (see here), but it never hurts to restudy positions, so long as you come to the topic willing to accept whatever the Bible has to say on the matter. Rolf Miller, a gospel preacher who smoked, took the affirmative in this debate, saying that smoking is not sinful in and of itself, but that in some instances it could become sinful. 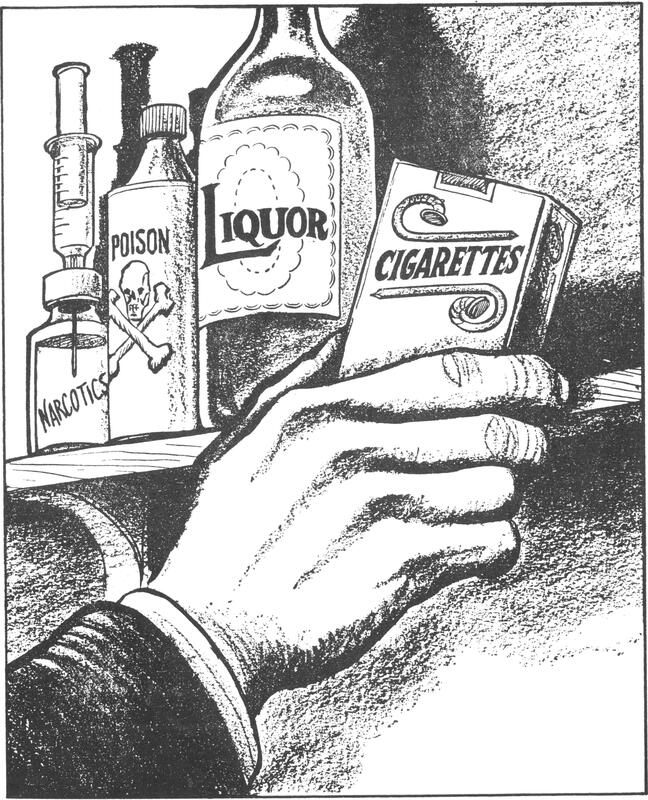 Eugene Britnell, a gospel preacher who had quit smoking several years earlier, took the negative position, stating that smoking did harm to the body, and therefore it was sinful. 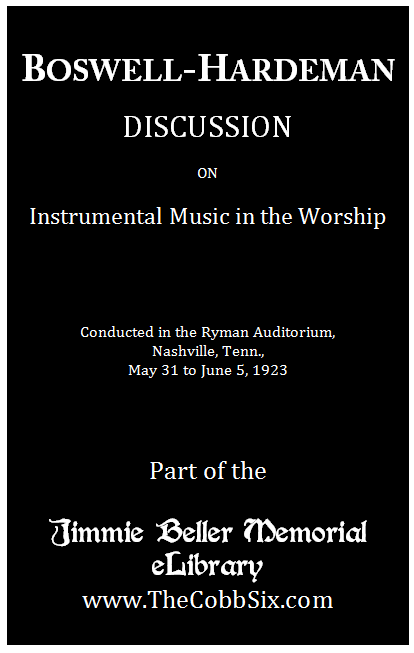 At some point in the future, I might post a review, giving my thoughts on the debate, and areas which didn’t get emphasized as they should have, but for now, I thought it’d be worthwhile to make it available for you as the latest addition to the Jimmie Beller Memorial eLibrary! This short debate (44 pages) features five presentations from each writer, as well as a summary from both. We hope that you find this debate to be interesting and a useful resource for your studies.